A stalwart of the comedy scene, Chris Forrest plays host to this motley crew of gag merchants. 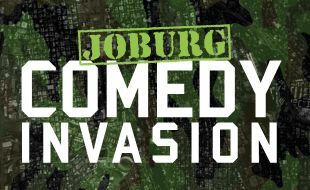 He is sure to tickle your funny bone with his musing on life as the quintessential Joburg family man. His dry sense of humour and quick wit has made him one of SA’s most popular comedians. Newcomer and fast rising star, Ebenhaezer Dibikwane, is one of the most in-demand comics of the new generation. He rose to fame after winning the Savanna Comic’s Choice Newcomer award in 2016 and is a regular face on the SABC2 sketch show, The Bantu Hour. Within minutes of his performance, it’ll become clear why he’s been racking up awards and accolades across multiple platforms. Comedy heavyweight, Joey Rasdien, headlines the gig. It’s such rare treat to witness this titan of SA comedy perform in an intimate space, so don’t miss out. His unique brand of silly and surreal will leave you laughing and pondering in equal measure, but in a good way.